The name deriving from the Greek Lenoi. The termindicates the recipient and vats using for pressing grapes. 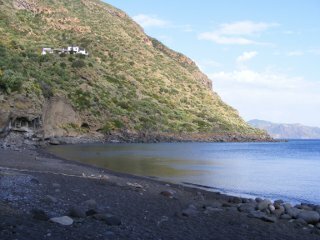 The only village on the island that is not on the sea, in ancient times it was the salvation of many inhabitants of Salina. Many times over the centuries its valley gave refuge to islanders terrified by the frequent raids that came from the sea. While at Santa Marina in the course of time a mercantile middle class arose, at Leni, thanks to the natural conformation of the place, a landed middle class was formed. In the 19th century Leni succeeded in attaining a very positive economics status. 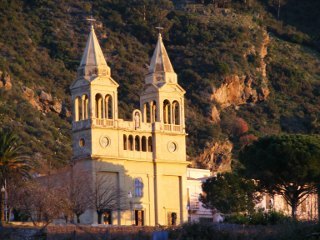 The proof of it lies in the building of the church of the patron saint, St. Joseph, in 1860, in addition to the restructuring of the Terzito church (see: Valdichiesa). The people of Leni, now as in the past, put the greatest enthusiasm into every initiative that can involve an effective development of the village, like for example the Table of the Patron Saint which for some time has been held on the first of May. The decision was rightly taken not to let this feast coincide with the Malfa one (19 March), and in this way everything is set up far the day of St. Joseph the Worker. Among the other initiatives we must mention that Leni council for some years in the Christmas period hass been organizing a beautiful living crib that has been greatly appreciated not only in Sicily but all over Italy. Moreover, this is an excellent place for anyone wanting to spend a quiet holiday, with rest and total mental relaxation. Once called Arenella, it began to be populated in the 18th century by families of peasants that previously lived in the valley, who also began to adapt to a fisherman's life. Soon, what until shortly before had been a little used harbour, became a place from which craft set out to take goods to Lipari and Santa Marina. 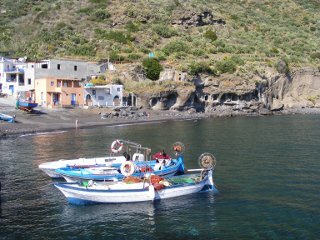 Subsequently the Rinella boats began to exchange the Lipari and Santa Marina products directly with the Campania coast. It was in Naples that the people of Rinella came inlo contact with the cult of San Gaetano, the saint of providence and a major healer. San Gaetano became the patron saint of Rinella, and automatically the protector of fishermen. Far this reason, on 7 August there is a singular procession with boats. This is certainly not an easy event to see in anotherplace. The present-day cathedral church date from 1853, but Bishop Beaumont spoke of a San Gaetano church during his voyage to Saline as long ago as 1736, It was probably the old church, later used as a dwelling, referred to by the Duke of Hapsburg Friedrich Hawranek, According lo some sources it was precisely the inhabitants of Rinella that took the cult of San Gaetano to Acquacalda. Today Rinella is the second commercial harbour on Salina and constitutes what might be defined the touristic outpost of Leni. The village is also famous for being the place where a part of Rossellini's famous film "Vulcano" was made, in this film there was a superlative performance by Anna Magnani, and a square is named after her. At Rinella a good craft tradition is rapidly developing and in the past few years the village has considerably increased its tourism. The sandy beach is not the only feather in the cap of Rinella, and new roads have been opened up that take visitors along routes dotted with fabulous panoramas. In the area going towards Pollara there are very beautiful beaches surmounted by big olives trees, and there are seabeds that would fill even the Caribbean areas with envy, while the area towards Lingua might appear more nondescript, but actually there is a surprise: there still exists the very old road linking the two villages, it is not in perfect condition, but there is already talk of an immediate recovery. Moreover, there is also an old road that for anyone desiring to move fast on foot links Rinella to Leni. It is certaninly worth going along. While you go up towards this tiny hamlet, you can admire the robinias that, placed on both sides the road, form a sort of arch. As the furtunate visitor goes through it, he or she can enjoy the scents of nature, that seem to grow denser in the sharp air coming doom from the mountain. Indeed, this is the coolest and most scented village on the island. At Val di Chiesa there is the sanctuary of the Madonna del Terzito, a cult place of great historical importance. It seems that the temple was first built by a Byzantine monk in the 5th or 6th century, the Marian one being one the most important cults brought to the west by eastern monks. Despite the wars between the Goths and Byzantines (535-553) and the material decay of the time, the fame of Maria Santissima della Salina continued to spread all through the Kingdom of Sicily. The empereror constant II decided to rebuild the temple in question. but Val di Chiesa, together with the whole island, was soon to fall into desolation. 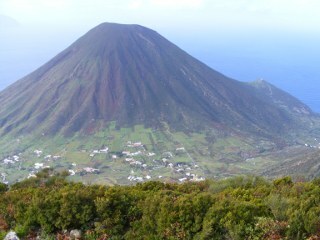 after many centuries, in which the island was repopulated several time, the Marian church was rediscovered by paesants culting down trees for a powerful Lipari man, Alfonso Mercorella. On 23 July 1622 the old church walls were rediscovered (still today on 23 July the feast of the petron saint is celebrated, though it seems that at one time on this date there was a celebration linked to commercial events). According to the legend the peasants' attention was cauht by the triple ring of bell, heard by Mercorella too. the church was rebuilt in the same year (at the same time as Santa Marina one), and from then on was called Terzito. There are two theories about the origin of this name: according to some it derives from the Spanish "tresillo", meaning a musical tercet, while for others (including Campis) the term indicates that the church was built three times. 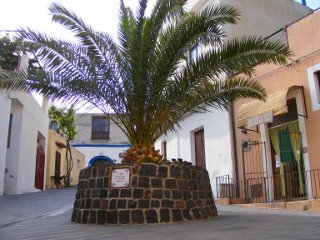 The cult spread even more than before, thanks also to the popularity of new Marian cults on the island of Lipari. From 1854 to 1860 a transformation of the church was made and at the same time a small convent arose. Crowning great Christian faith, seen in a active and concrete form, in1954 next to the church a rest home for eldery and/or sick people froom all the seven islands was inaugurated. The rest home still functions very actively, thanks to a group of nuns who belive totaly in their work (which they clearly identify with their mission). Behind the sanctuary, which is right on that saddle that divides the two big Salina mountains, there is one of the many roads that lead to the rop of Monte Fossa delle Felci (where you can admire some chestnut trees planted in the Roman period); this is probably the esiest road.